It's always headline news around here when Queen Letizia decides to dig something new out of the vaults. 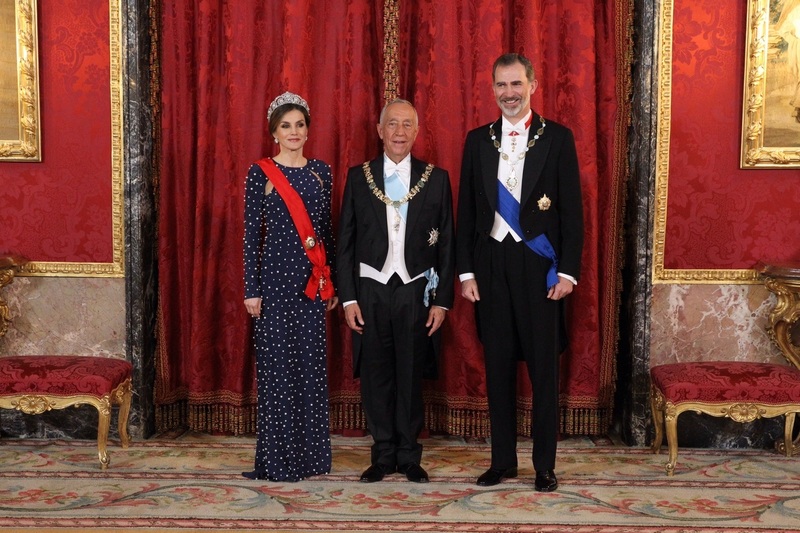 The King and Queen of Spain hosted a state dinner for the President of Portugal during his state visit to Spain today. This is her first time wearing the Cartier Diamond and Pearl Tiara, which belonged to Queen Victoria Eugenia and went to Infanta Maria Cristina before making a return to the main line and being worn by Queen Sofia and (on one occasion) Infanta Cristina. (Check out the tiara's full story here.) This is my favorite of the larger Spanish tiaras and it looks perfect on Letizia, tipped back just a bit. 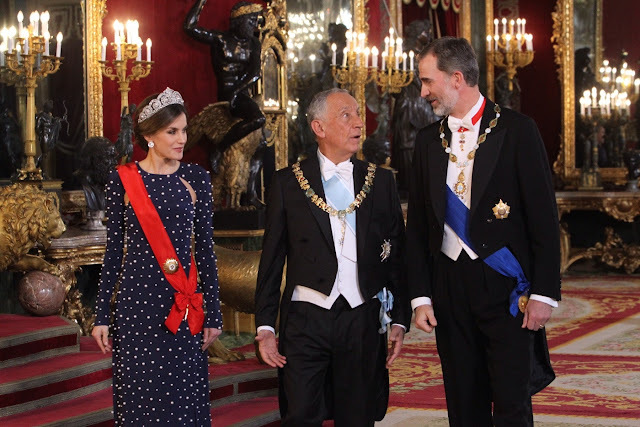 She paired it with the diamond earrings from the joyas de pasar and, of course, the sash and star of Portugal's Order of Christ. Just as she continues to experiment with jewels, Letizia continues to experiment with new designers, wearing a dress here by Ana Locking. This dress is a full-on Monet: a gorgeous star-filled evening sky from afar but a hail storm so harsh it'll rip your sleeves when viewed close up. But it definitely calls for a pearl tiara and this one's a winner, so I can only be all on board.